A common criticism with most monster movies, specifically ones like Gareth Edwards’ Godzilla, is that there’s more focus on the uninteresting characters than there is the giant creature that’s going around destroying things. 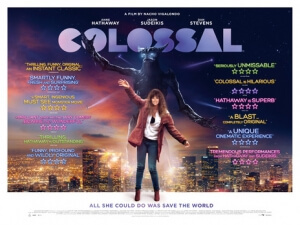 Supposedly, writer-director Nacho Vigalondo heard this complaint and, with his latest film Colossal, decided to really play around with it and ended up making a monster movie that can genuinely be classified as a true original – primarily because the humans are infinitely more engaging than the actual monster itself. In fact, humanity is key to the film’s core; it begins as alcoholic writer Gloria (Anne Hathaway) is dumped by her frustrated boyfriend Tim (Dan Stevens), and moves back to her home town where she reacquaints herself with childhood friend Oscar (Jason Sudeikis). It’s at this point, or specifically after a heavy night of drinking, that news emerges of a giant monster appearing and stomping all over the city of Seoul. Everyone watching on TV is horrified, but none more so than Gloria who soon realises that, in a bizarre twist, the monster is connected to her every move, whenever she steps onto a playground at a certain time in the morning, right as kids pass on their way to school. It is the first of many strange, surprising twists that the movie makes, and to give much more away would be to really ruin a lot of what makes this movie work so well. You should go into this movie as fresh as possible, without looking up the full plot synopsis online or anything, because the directions you think this movie will take, based on the above description of the plot, are likely to be wildly different than what actually ends up happening. What I will say, however, is that it’s an extremely fascinating take on the monster movie genre, one where the majority of the kaiju action is literally background noise, played out on TV as the main human characters watch and ponder their own miserable life choices. It also has some things to say about the art of self-loathing, with Hathaway and Sudeikis’ characters wasting their lives away in alcohol and generally progressing absolutely nowhere in their lives whilst feeling bitter about it all, until the monster shows up on the other side of the world and, though its strange turn of events, ends up altering their lives for better or for worse. It’s smartly directed and written in that both elements of the story can co-exist without feeling like two separate movies, and the themes of self-hatred and the self-destructive paths people can take – in Hathaway’s case, it’s literally destroying an entire city in South Korea – neatly tie into the regular tropes of monster movies that Vigalondo gleefully plays around with. Without giving a large chunk of the story away, or in this instance an entire character arc, know that while Hathaway is as fun and interesting a lead as she usually is, this is really Jason Sudeikis’ time to shine. The former SNL cast member has thrived in comedic roles over the past few years, as well as a handful of more serious roles like in Race and The Book of Love, but his role in this is a rare chance to show us what he can really do as a legitimately strong performer, playing with all sorts of emotions and underlying character traits that give him plenty of material to work with, and he more than steals the show here. At first, you think his character is going to end up as the romantic interest for Hathaway’s lead – it’s certainly set up that way, as they’re both childhood friends and seem to be going through similar feelings of un-fulfilment with one another – but again, this is where the unpredictability of this movie really comes in, as by the end of it you will have never felt more bittersweet sorrow and genuine fear for an actor who once played Mitt Romney on SNL. He is legitimately fantastic in this, and if nothing else this should get him more roles in the future that do more than just show us that he’s good at making people laugh. If monster movies are your bag, then it’s important to know going in to Colossal that this is definitely not a traditional genre flick; in fact, being traditional is the last thing on this movie’s mind, as it’s a genuine original and a fascinating alternative take on the whole kaiju angle, one that could very well stick in audiences’ minds for quite some time. Colossal is a fascinating alternative to the monster movie genre, putting its focus way more onto its human characters and themes of self-loathing and self-destruction than the actual kaiju itself, and thanks to some strong writing and direction, as well as two strong lead performances by Anne Hathaway and especially Jason Sudeikis, it is a strange experiment that certainly pays off.